[top] - An approximately one-light-year tall "pillar" of cold hydrogen towers above the wall of the molecular cloud. The 2.5-million-year-old star cluster called Trumpler 14 appears at the right side of the image. A small nugget of cold molecular hydrogen, called a Bok globule, is silhouetted against the star cluster. 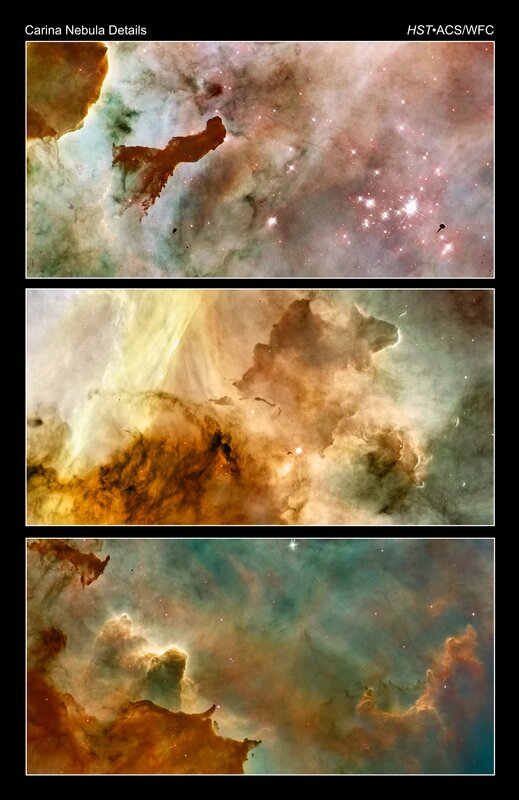 [middle] - Detailed view of the central portion of the Carina Nebula near the so-called Keyhole Nebula. [bottom] - These great clouds of cold hydrogen resemble summer afternoon thunderheads. They tower above the surface of a molecular cloud on the edge of the nebula. So-called "elephant trunk" pillars resist being heated and eaten away by blistering ultraviolet radiation from the nebula's brightest stars.